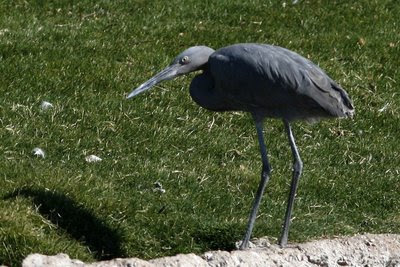 Around January 1, a local bird enthusiast turned up a Reddish Egret - a rare species this far inland in Arizona. 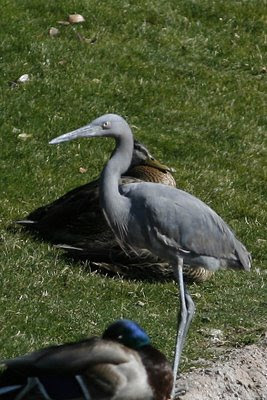 This bird, a juvenile, looks much like a Great Blue Heron at a casual glance. However, on a closer look, it is noticeably smaller and has a dark bill. When it matures, it gets a reddish color on its head and neck. Typically, Reddish Egret stays along coastal Gulf of California and the coastal areas of the Gulf of Mexico. This bird was located in Chandler, AZ in an area known as Aquila Ocotillo, a business development with several ponds, a nearby canal, and some undeveloped plots of land. This area is still undeveloped enough to attract an interesting array of species, including Neotropic Cormorant, Double-Crested Cormorant, many duck species, Great Egrets, Green Heron, and Great Blue Heron. A Brown Pelican was a highlight last winter. On some days this January there have been well over 150 Great Egrets in this area.